With revised designs for 2011, we believe that the Easy and the Unico are perfect for use in conservatories and other domestic applications as they do not require any outdoor units and can be operated from a normal 13 amp electrical supply. Olimpia units come with a 12 month RTB warranty. 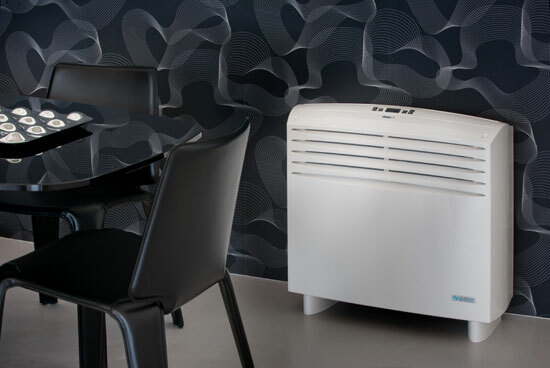 Designed by King and Miranda, the Easy is a low level floor mounted self contained air conditioning unit which requires no external unit - just two small holes through an outside wall. Unit dimensions are 666mm high x 693mm wide x 276mm deep. Perfect for use in domestic conservatories, lounges and bedrooms, the Easy has a cooling capacity of 2.05kW and operates with a low noise level of 36dbA. Please note that the Easy is a floor standing unit supported by the floor, but can be mounted agaist a wall. The Unico is a slimmer higher capacity unit (2.1kW or 2.6kW) with a low height of 516mm making it perfect for mounting against dwarf walls found in most conservatories. Unit dimensions are 516 high x 902mm wide x 229mm deep.Noise levels as low as 34dbA are a feature. 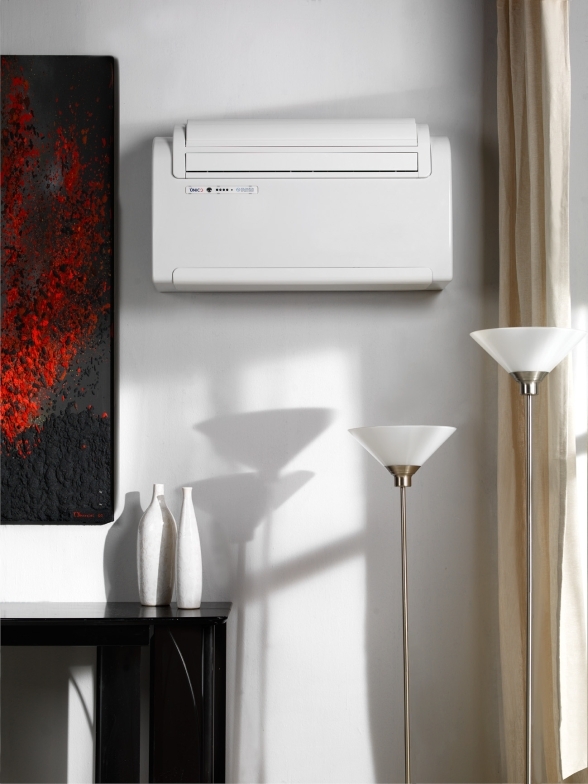 The unit is available in both heating and cooling modes and comes equipped with an infra red remote controller. 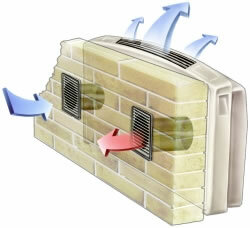 The unit is wall mounted and can be used at high or low level. 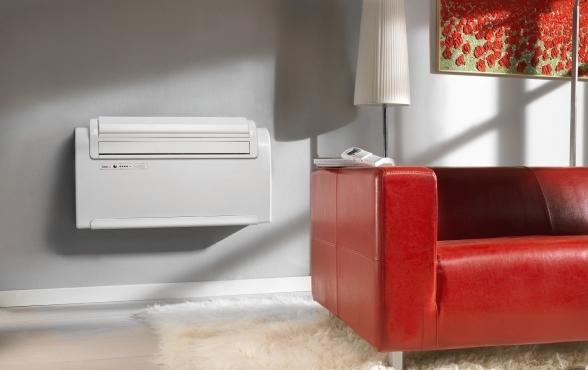 For 2011 Olimpia Splendid have introduced additional higher specification Unico models utilising DC Inverter technology. 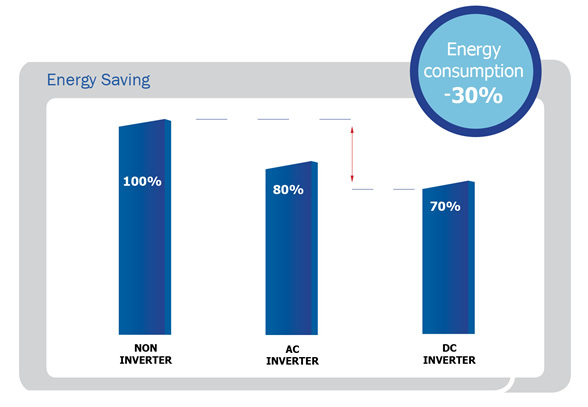 DC Inverter technology with a variable speed compressor, allows the compressor within the unit to adjust its speed to match the required performance exactly - this compares with a conventional fixes speed system which operates at full speed and switches off and then later switches on again to try and control temperature. Better room temperature stability and comfort. 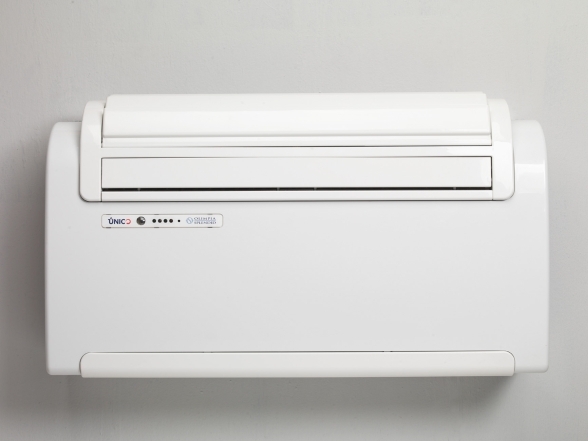 For summer 2017 we have limited stocks of Xpelair Digitemp Air 8 HP - these are Xpelair branded versions of the Unico Air 8 HP and have identical dimensions and performance but offered at a special price of £749 excluding VAT (£898.80 inc VAT). This special price applies to purchases by pro-forma invoice or debit card only. Stocks of this special offer unit are very limited. Please call us on 01706 367 500 for availibility or further details. Any Unico is ideal for installation in conservatories and other domestic rooms. Click here to see a previous model Unico conservatory case study. To buy one of these units please call us or email us - units are in stock. © 2013 Celsius Air Conditioning Ltd. - all rights reserved.